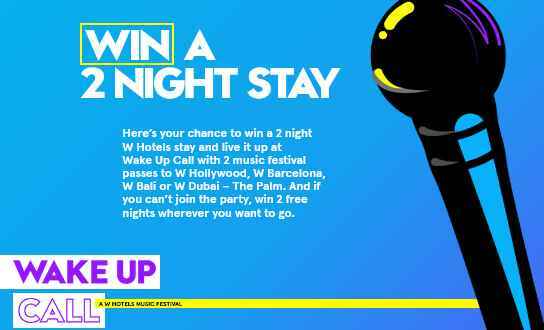 Enter the W Hotels The Store Wake Up Call Sweepstakes now through August 15, 2018 for your chance to win 2 night stay for two people at any W Hotels location plus with 2 music festival passes to Wake Up Call depending on W Hotels location. How To Enter: During the sweepstakes period go to their dedicated link: www.whotelsthestore.com/WakeUpCall and follow the online instructions to register by entering all information requested on the registration form and once you filled out the entry form now Click on the sign me up button to complete the registration form. Prizes: One grand prize winner will win a Two (2) consecutive night stay for winner and a guest at any W Hotels location plus two (2) free passes to Wake Up Call depending on W Hotels location and dates chosen. The maximum ARV of the Grand Prize is USD $2,000. When To Enter: The W Hotels The Store Wake Up Call Sweepstakes entry begins on July 9, 2018 at 12:00 a.m. United States Eastern Time (“ET”) and ends on August 15, 2018 at 11:59 p.m. ET. Who’s Sponsor: The Sponsors are Marriott International, Inc., 10400 Fernwood Road, Bethesda, MD 20817 USA and Hotels at Home, Inc., 208 Passaic Ave., Fairfield, NJ 07004 USA.